Southwest: the official airline for racists and bigots! As a frequent flyer, I have traveled with the Southwest Airlines a few times. In my operational excellence classes, I have often used it as an example of standardization. But I have stopped flying the airline for quite some time. Its “You Are Now Free To Move About The Country” has become a wildly outdated slogan, and, as noted by other observers, perhaps the addition of the phrase “If Not A Minority” would help. 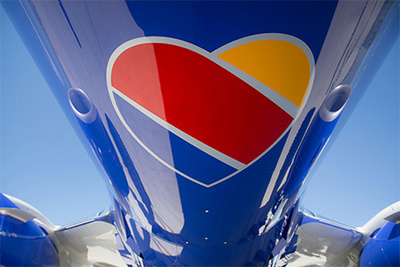 Truly, when it comes to Southwest Airlines the terms – bigotry and racism - come to mind now, and nothing else. That is a sad commentary for the world’s largest low-cost airline carrier whose crew were once considered very sky-friendly! Last year in one of the flights, from Indianapolis to Los Angeles early Sunday, Southwest Airlines was diverted and landed in Kansas City as a result of “suspicious behavior” by a group of passengers at the back of the plane. During the unscheduled stopover, passengers were deplaned and bomb-sniffing dogs were brought aboard. The flight was then re-boarded and continued on without the three men, who were forced to take a later. They were not charged with any crime. In another incident last November, at least five travelers were told they had to get off a Southwest Airlines plane preparing to take off from Chicago to Houston. That flight was delayed but, in this case too, the passengers were allowed to take a later flight. Perhaps the most striking incident also happened last November, when Maher Khalil and Anas Ayyad, two young Palestinian-Americans attempting to board a flight from Chicago to Philadelphia, could be overheard by another passenger speaking Arabic. Khalil and Ayyad were stopped from boarding the Southwest Airlines plane and told of the complaints: someone was afraid to fly with them. I wish harassment of Muslim passengers has stopped and the situation improved, but surely not with the Southwest Airlines, which seems to epitomize racism and bigotry. Inexcusably, Southwest Airlines continues to allow racist and bigots to kickoff Muslim-looking passengers. It is simply obscene and unacceptable in our time. Last week, a hijab-clad Muslim woman in the US was removed from a Southwest Airlines. Hakima Abdulle, a Muslim woman from Maryland, said she was removed from the flight from Chicago to Seattle “without any credible explanation”. Zainab Chaudry, an official with the Council on American-Islamic Relations, said in a news conference that Abdulle had boarded the Seattle-bound aircraft on Wednesday when a flight attendant told her she would not be permitted to remain on board. Airport police then escorted Abdulle, who is of Somalian descent and was wearing a hijab, to the ticket counter, where she waited several hours for a later flight, Chaudry was quoted as saying by The Baltimore Sun. When police asked the flight attendant at the gate if there was any reason why Abdulle had been taken off the plane, the flight attendant reportedly replied, “No” and that she did “not feel comfortable” with the passenger. This was the second such incident involving the carrier this month after an Iraqi man who is a UC Berkeley student was ejected from Southwest Airlines flight after speaking Arabic. The victim of harassment, Khairuldeen Makhzoomi, a 26-year-old Iraqi refugee, left Iraq in 2002 after his father, an Iraqi diplomat, was killed under Saddam Hussein’s regime. His family fled to Jordan, where they lived until the United States granted his family asylum. On April 6, 2016 Makhzoomi was supposed to fly from Los Angeles to Oakland, get to campus and go to class. Instead, Makhzoomi was removed from Southwest Airlines flight 4260, detained by security officers, questioned by the FBI and refused service from Southwest after speaking Arabic before his flight took off. One day prior to the incident, Makhzoomi attended a dinner at the Los Angeles World Affairs Council with Secretary-General of the United Nations Ban Ki-moon. When Makhzoomi hung up, he noticed a female passenger looking at him. Once he made eye contact with her, she got up and left her seat. Minutes later, an airport employee arrived to remove Makhzoomi from the airplane. Makhzoomi was escorted onto the passenger boarding bridge where he was met by three security officers. Makhzoomi was removed from the jet bridge and taken back to the gate where more security officers, police dogs and Southwest staff awaited him. Dozens of onlookers watched as he waited for the FBI to arrive. In the meantime, security officers searched his bag again and continued to ask him if he had any other luggage he was keeping secret. Makhzoomi alleged that one police officer publicly searched his genital area and asked him if he was hiding a knife anywhere. When the FBI arrived, Makhzoomi said they began questioning him about his family, the phone call he made on the plane and everything he knew about martyrdom. After the interrogation was over, an FBI agent informed Makhzoomi that Southwest would not fly him home. Makhzoomi collected his refund and left Terminal 1 to process what had happened. Makhzoomi called Southwest on Monday and they ensured his status was clear but offered him no apology. This is what all the Islamophobia or fear-mongering has wrought. I am really horrified about racial profiling by airlines. Someone should sue these airlines for their racial/religious profiling acts. But Makhzoomi does not want to sue Southwest Airlines for the suffering it caused. He is very forgiving and has a good heart! Since he arrived in the United States, Makhzoomi has worked at a Cheesecake Factory, built a school in a Syrian refugee camp in Jordan, worked his way through community college, transferred to UC Berkeley where he is part of Model United Nations and the Berkeley Political Review and currently writes for the Huffington Post. This summer, Makhzoomi will be representing Iraq at the Young Leaders Visitors Programme at the Swedish Institute. Makhzoomi said he hopes to one day return to Iraq, which will always be his home. Southwest Airlines is a repeat offender. Its racist and bigotry-ridden policies are against the American values and promote negative values like fearmongering, intolerance and hatred. While security is important for all, let’s not forget that harassment is simply unacceptable. As Ali Gharib has wisely suggested, both our American values and security would be better served if we – Americans who are simply flying on planes or working for the airlines – treated all people, no matter what language they were speaking, equally, saving our suspicions for people actually acting suspiciously. It is criminal to reward an airline that is quickly becoming the official airline for the country’s bigots. Let the immigrant community boycott Southwest Airlines and send a strong message that its racial profiling and bigotry are simply unacceptable.